February | 2015 | sausageheavenoutdoors Enjoy making homemade sausage, Tasty way's to BBQ, smoking meats and poultry. See how northern Minnesota was settled and the life early homesteader's lived their lives and more!! Anglers will have more opportunities to fish for bass, sturgeon and trout this year thanks to changes in Minnesota’s fishing regulations. Fishing regulations changes are summarized on page six on the 2015 Minnesota Fishing Regulations booklet, which will be available by Sunday March 1, at any license agent or online at http://www.mndnr.gov/fishmn and http://www.mndnr.gov/regulations/fishing. Beginning Saturday, May 9th, anglers in most of the state can catch and release bass until the regular harvest season opens Saturday, May 23. Meanwhile, anglers in northeast Minnesota can continue to catch and keep bass during these two weeks. Northeast Minnesota is defined as essentially north and east of U.S. Highway 53. In another bass season change, the fall closure on harvest of smallmouth bass has been lifted in the northeast. Interested in ddoing more bass fishing in Minnesota this year? Learn more at http://www.mndnr.gov/fishmn/bass. Anglers will have more opportunities to fish for lake sturgeon starting March 1. However, season dates differ depending on location. On inland waters and Minnesota waters bordering North Dakota, South Dakota and Iowa, a new catch-and-release season will allow anglers to fish for lake sturgeon from June 16 until April 14, a season lasting nearly 10 months. Anglers here cannot fish for lake sturgeon from April 15 to June 15, a closure intended to protect the fish during their spawning season. On Minnesota waters bordering Canada there are harvest, catch-and-release and closed seasons for lake sturgeon. On waters bordering Wisconsin, there is a lake sturgeon harvest season in the St. Croix River south of Taylors Falls including Lake St. Croix, but otherwise all waters have catch-and release lake sturgeon seasons that differ depending on date and location. Season details can be found in the border waters section of the fishing regulations at http://www.mndnr.gov/fishmn or on page 43 of the 2015 Fishing Regulations booklet, which will be available online at http://www.mndnr.gov/regulations/fishing on March 1. 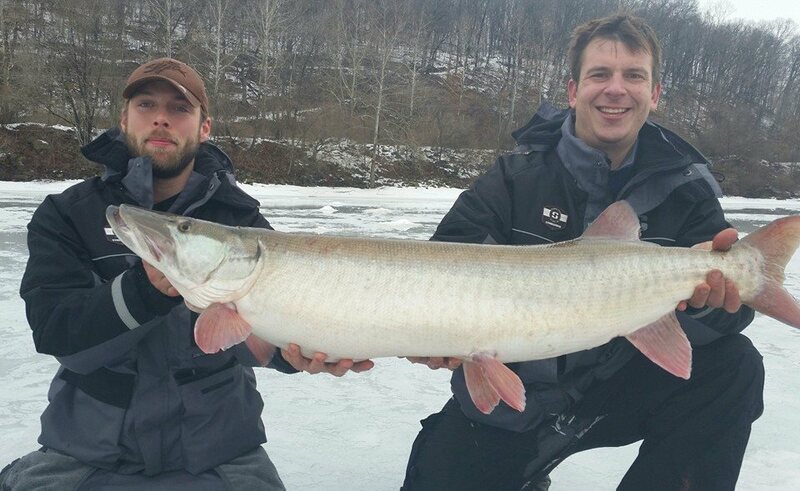 This year, the minimum length limit to keep a muskie is 54 inches. The previous limit was 48 inches. Various muskie angling organizations supported the change. Exceptions to the new 54 inch minimum length limit apply for muskie-northern pike hybrids, also called tiger muskie, in the seven-county metro area, where the minimum length limit remains 40 inches on certain lakes. Expanded seasons for stream trout, both in streams and winter fishing in lakes. New limits and seasons on Minnesota waters bordering Canada, including a new size restriction for walleye that becomes effective March 1 [only one walleye will be allowed in possession over 20 inches, where previously there was no size restriction]. The flathead catfish season will close in winter. 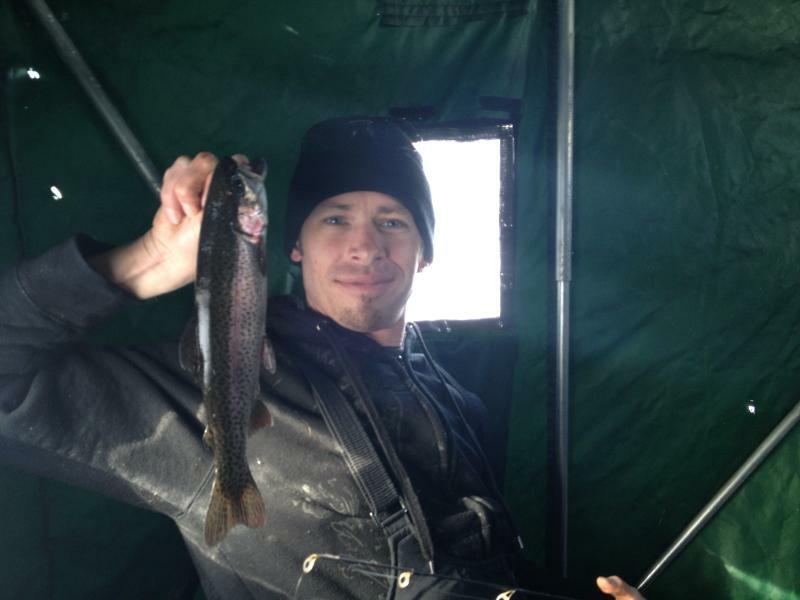 Anglers are also reminded to check online at http://www.mndnr.gov/fishmn and http://www.mndnr.gov/regulations/fishing for the latest additions or corrections. In addition, changes to special or experimental regulations may be in effect, and are listed by lake online and in the special regulations section of the printed booklet. 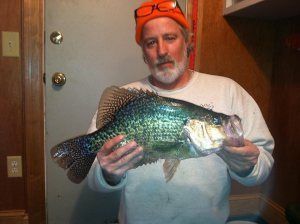 Mark Koehnen caught this giant crappie on Lake Waconia. 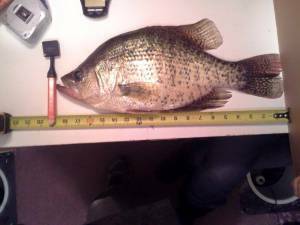 The tape measure showed an incredible 19 inches length and it tipped the scales at 3.26, but the official weighing didn’t take place until at least a day after since the bait shop, In Towne Marina, was closed when he came off the lake. Congratulation Mark!! Should look great on your wall. Nicholas Colangelo and Luke Wholey were out fishing on the Pymatuning Reservoir when Colangelo reeled in a fish that stunned both of them. “The weight was unbelievable, I’ve caught a lot of muskies, but never felt anything like this,” Colangelo said. The giant Musky, which was suspected of being about 30 years old, measured an astounding 53 inches in length and took about 30 minutes to reel in. “We brought it in through a 10-inch hole in the ice, and it barely fit through the hole,” Colangelo said. After taking a few photographs, the duo decided to release the fish back into the water. “These big fish are so rare, and so old, it’s really important that we let them go,” Colangelo said. This is a great site from the DNR. Take a virtual tour of Minnesota’s state parks, recreation areas, state trails, and even some of the state water trails. Panoramic, video, and snapshot tours are available for many locations. Take a peek and plan your trip!!! http://www.dnr.state.mn.us/state_parks/virtual_tours.html. What is a good day of fishing anyway. Just being out there fishing that’s what it is. I was out with Tony yesterday on one of my favorite lakes, Grindstone Lake, near Sandstone Minnesota. [See more on Grindstone Lake in the Where To Go page]. I have fished this lake for many years, both on hard water and open water. 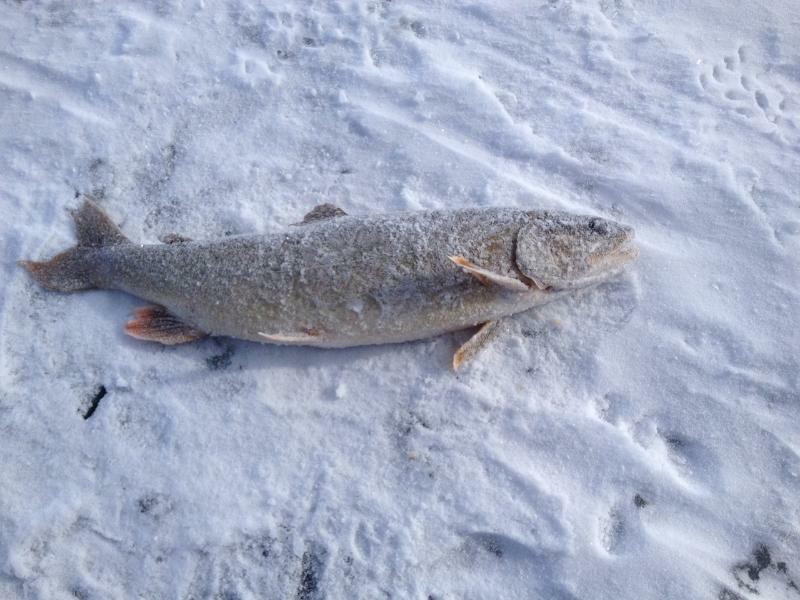 Yesterday was kind of a unexpected day as far as lake trout. I usually fish for lakers in deeper water, and was targeting rainbows, fishing in about 5 feet of water. Rainbows like to cruise these shallow depth, but I sure didn’t expect small groups of lake trout to cruise by as well. We spotted some rainbows here and there, and one 13 incher nailed my teardrop with a waxie attached. Then about 15 minutes later a large lake trout swam right under our holes. We tried to entice the laker into biting but he wasn’t fooled [ or just not hungry]. Then a little later two or three more lakers came by to visit us, with again no takers. I put a fresh waxie on my teardrop panfish jig since it’s been in the water for some time. Few minutes later as I was twitching the jig about a foot under the ice, a big head appeared and inhaled the jig. It was one of the lakers, a nice 4 pounder. Couple of fist bumps and a cold one to celebrate the catch. I was using 2 pound test florocarbon mono. We were limited for time so we packed up with a few rainbows and that nice laker to keep that smoker busy soon. Any day is a good day to be out in the outdoors. Here are a couple of pictures of the lake trout and one of the rainbows that Tony caught.